1.Each Month our members receive 8, 12 or unlimited classes to utilise wherever they wish. This means that if you have a busy week you can make it up later on and still be consistent in the long term. 2. Members can sign up for classes without paying for them way in advance which means you can reserve all the times/days that work but for your schedule before anyone else. 3. Members are able to switch to any class on the same day. If the alarm clock doesn’t go off for that 6.30am class or you don’t get out from work in time to make the 5.30pm class you can switch to any other class you can that day without losing your class. 4. As a member you get a “life happens” pass each month. This allows you to “miss” a reserved class and make it up later in the month for free! Gold members receive 2 passes per cycle. 5. Members can freeze there membership payments in 2 week increments, up to 3 months per year, for a $10 once off fee. 6. Members receive discounts off of services like creche, remedial massage, retail products and speciality workshops. 7. Silver and Gold members can bring any friend they wish to class with them once per quarter for free. 8. Gold members receive a free private session every 6 months of their membership. 9. Silver members can take additional classes for $12.50 each. 10. 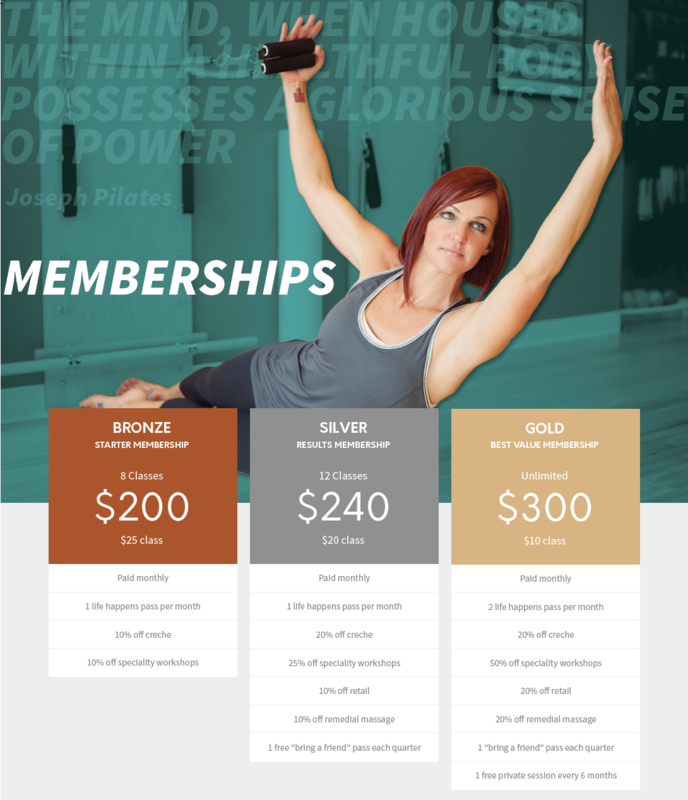 Bronze members can take additional classes for $17.50 each. 1. Your ongoing membership fee will be paid monthly in advance at the start of each cycle on either the 1st or 15th of each month. 2. You can pay by your specified payment option, which can be either a direct debit from a transaction account or a credit card. We accept Visa or MasterCard with a 2% surcharge. 3. If your deducted payment is unsuccessful a $10 fee will be charge to cover third party fees and the payment will be attempted again 5 business days later. 4. Each new membership has a minimum of 2 months activation. 5. Your membership is continuous month to month. Two weeks written notice is required via our cancellation form sent to our administration team if you want to cease your membership payments with us. 6. Sessions do not roll over or are able to be saved, they must be utilising within each cycle or are forfeited. 7. To cancel or reschedule any bookings 24 hours notice is required. Failure to cancel within this time frame results in that session being lost. This policy is in place out of courtesy to other clients who may have been waitlisted or wanting to book into your class. 8. You voluntarily accept and assume all risks flowing from participating in the services and agree not to make any claim against The Pilates Klinik for compensation or damages of any kind (whether direct indirect, consequential, economic, special or otherwise) that may be suffered or incurred by arising in connection with this agreement or the services other than as a result of negligence by us. 9. Memberships may be frozen in multiples of 2 weeks, up to a maximum of 3 months per calendar year to accommodate any holidays, illnesses etc. Freezing a membership requires written notice via our suspension form with 48hrs notice and has a once off administration fee of $10. 10. The member acknowledges that we may either close or reduce hours over long weekends, over Christmas, New Year and Easter and this has been factored into the direct debit pricing. 11. It is recommended new clients complete our new client pack of two privates before commencing the any Group Reformer Membership. 12. Members who utilise the creche will be automatically recharged for a new pack of 10 sessions if they do not repurchase one themselves in the circumstance where they owe for sessions used. 13. Members will be automatically charged for additional sessions taken beyond their allotment at the end of the cycle at the rate described for their membership type. 14. Members who take advantage of paying upfront for 12 months will not be able to cancel their membership for a refund. In the case of prolonged injury or illness an extension on the frozen period may be granted with a doctors letter.